The forex chart you see below is the NZD/CHF. This pair is trending down on the D1 time frame. The current support is at 0.7140, noted by the red line. You can set a price alert here. When the alert hits you can check The Forex Heatmap® for entry verification. 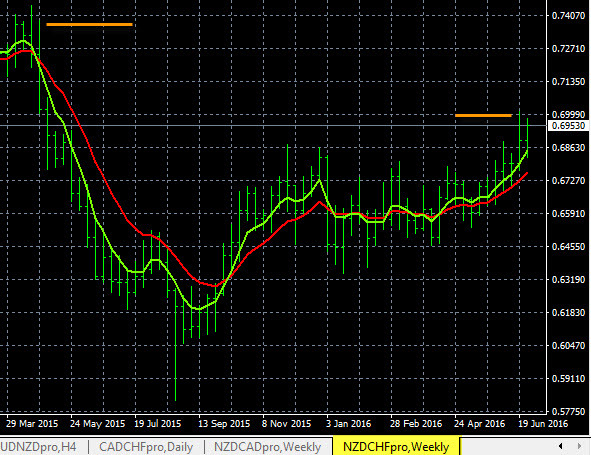 Look for consistent NZD weakness or CHF strength or both on entry. We see no nearby support below the alert price, so the pip potential is excellent. The charts that we use for trading are exponential moving averages set on on a meta trader platform, across multiple time frames. Today in forex trading the EUR/NZD has a sell signal on The Forex Heatmap®. The New Zealand Dollar (NZD) was strong in the Asian session and this carried forward into the main trading session. Overnight movements on the NZD pairs were strong just ahead of today’s main trading session. Most NZD pairs are trending based on NZD strength. We expect the EUR/NZD to continue lower in the downtrend and the NZD/CHF to continue higher in the uptrend. The trading signals show below are from The Forex Heatmap®, a visual map of the forex market, the Asian session is on the left. Today in forex trading the NZD was weak on all pairs. These movements started early in the main trading session. 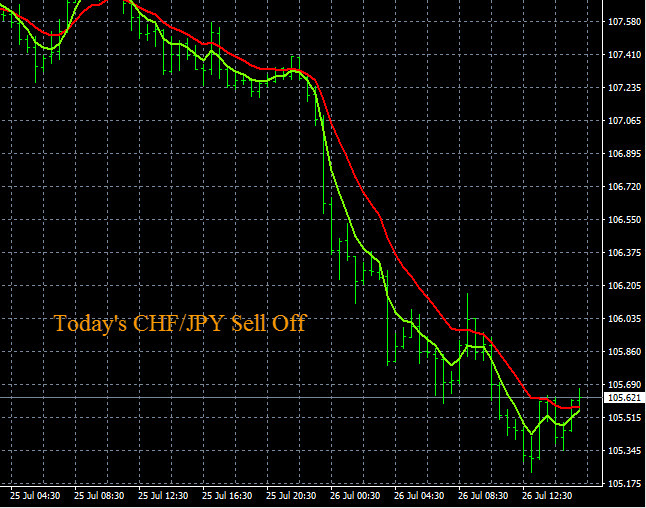 The Euro (EUR) and CHF also had some strength today so the NZD/CHF dropped and the EUR/NZD moved higher. Both of these New Zealand Dollar (NZD) pairs should continue in their current trends. The EUR/NZD should continue up to the 1.6700 target resistance area. The trading alert system you see below is The Forex Heatmap®, which give live alerts for 28 currency pairs. Today in currency trading markets the NZD was strong on all pairs in the group, driving strong movement and trade opportunities. Pairs like the NZD/CHF had substantial movements to the upside and should continue upward to the target area resistance levels specified in our trading plans. The EUR/NZD moved strong to the downside and should continue to the target support area specified in our plans. Both pairs are trending on the D1 time frames. 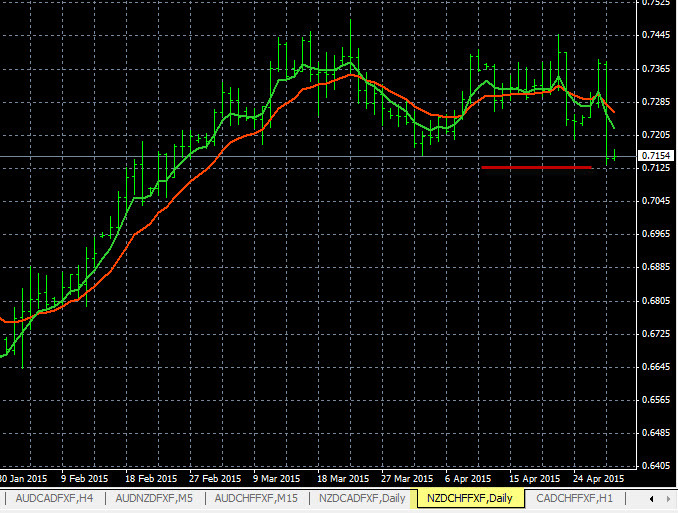 Other pairs like the NZD/USD and GBP/NZD also had good short term movements based on the NZD strength. The currency strength indicators you see below is the Forex Heatmap®, which gives currency trading signals for 28 pairs.